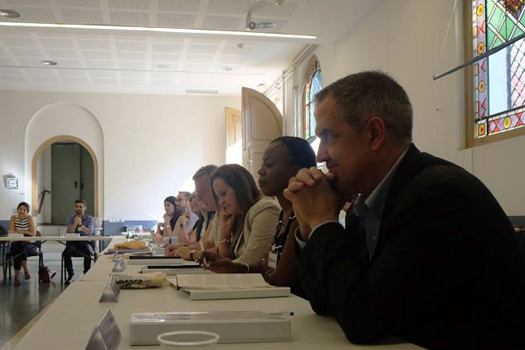 How do questions of justice impact peace processes? And what do processes from Colombia to Northern Ireland and beyond tell us about this relationship? Those questions guide our class "Negotiating Peace and Justice: A Course on the Place of Transitional Justice in Peace Processes," held October 9-13 in Barcelona, Spain in partnership with Barcelona International Peace Resource Center (BIPRC) and the International Catalan Institute for Peace (ICIP). In the aftermath of large scale and systematic violations of human rights, transitional justice aims at restoring confidence in the rule of law through approaches centered on the rights of victims and prevention of future violations. It does so through the application of policies and measures that vary in form, sequence and can take place over short or extended periods of time. Conventionally these measures include criminal prosecutions, commissions of inquiry and “truth commissions”, programs aimed at individual and collective reparation, and measures of constitutional, legal and institutional reform. The primary characteristic of transitional justice is that it seeks to achieve its goals in conditions where there exist significant political constraints. The negotiating of peace to end conflict represents perhaps the most challenging context where these constraints are at their most acute. Negotiations are increasingly seen as more than discussions between warring parties: they often include representatives of the people most directly affected by the conflict in particular – the victims – and of society more generally. Peace processes aim to do much more than find a way to address the needs of victims looking for justice: they must put an end to conflict operations; address on-going humanitarian crises and propose viable solutions for the underlying causes of conflict. Yet the prospect of dealing with the egregious violations of human rights committed in conflicts frequently represents a profound challenge for progress. ICTJ, BIPRC, and the ICIP are pleased to announce an Intensive Course on Transitional Justice and Peace Processes. It will focus on practical examples of recent or paradigmatic peace processes where the question of justice formed a significant part of the negotiating context. It will raise a series of questions on substance, process, participation and review how things worked out in practice. The aim is to provide course participants with a firm grounding in the basics of transitional justice and to understand the challenges, options and implications of different approaches to the justice question in peace processes. The first day of the course will provide an introduction to the practice of transitional justice based on reading previously distributed. The majority of course will then be given over to discuss and analyze a number of different peace processes, current, recent and past, to look at how the issues have been addressed. Processes to be considered include Colombia, South Sudan, South Africa, Guatemala, Northern Ireland and Syria. Did the inclusion of justice measures in the negotiations or agreement require specific trade-offs? If so, what were they? Were there particular contextual factors that influenced the inclusion or exclusion of justice issues, such as international law or the balance of political power among the different actors? Were there any parallel informal processes to the official process in which justice issues were addressed? Did the exclusion of justice issue (in general or specific issues) from negotiations or an agreement negatively or positively affect broader peace process? Could the inclusion of any particular justice issue be said to have had a negative effect on peace, especially in the short term? What was the technical awareness of negotiators and their advisers of experiences and possible approaches; how were discussions on justice issues structured? What options were chosen and why? Who participated in the discussions – to what extent if any was civil society or victims’ representation part of the process? What was the quality of the outcome of “justice issue”? To what extent can it be said to have been important or essential to the durability of the peace process? The course format includes a combination of lectures, small group discussion, simulations, and an exchange of practical experiences from the participants. The course will be held from October 9-13, 2017 at Sant Felip Neri House in Barcelona, Spain. The program is targeted at mid-career and senior staff at multilateral agencies, governments, NGOs, foundations, and universities. Practitioners directly involved in countries dealing with peace processes are especially encouraged to apply. Instructors include top level experts and practitioners, such as Fernando Travesi, Ruben Carranza and Howard Varney, among others. Participants will be sent selected reading materials in advance, and receive a comprehensive resource packet for future reference upon completion of the course. This course will be taught in English and a high proficiency level is required to fully benefit from attendance. The course fee is US$ 2,200. This fee includes accommodation (6 nights) at a hotel in individual living quarters; all meals, including daily refreshments; and all course materials. It does not include the cost of insurance and travelling to Barcelona. Payment arrangement information will be included in acceptance letters. Unfortunately, ICTJ and BIPRC cannot provide any scholarships or waivers for the course fees this year, but we can provide participants with letters of support in obtaining sponsorship, within the participant’s country of residence or work. We do not cover participants' travel, visa, or insurance costs. We can provide logistical assistance and letters in support of participants' visa applications upon request. To apply for the course, please submit: a one-page letter of motivation (maximum), Curriculum Vitae, a copy of your passport, one letter of reference, and a completed application form to bcncourses@ictj.org. Download the application here as a Word Document. Applications will be accepted until August 25, 2017. Successful applicants will be notified by soon after. If you have any questions about the application process, please contact Kelen Meregali at kmeregali@ictj.org.